The binoculars slide into Carmelo Ciancio’s grasp automatically as he sports a flurry of color just beyond the deck of his Huntingtown, Maryland home, a panoramic haven for nature lovers. A male wood duck touches down on the pond, its rainbow of feathers glistening like jeweled threads. Subconsciously Carmelo registers the lustrous curve of green at the crest, the bright orange-red of the bill, and the chestnut and yellow on the chest and flanks. Like so many scenes from this rural backdrop, it will appear in all its vivid detail on a masterful scratchboard painting done in his glass-enclosed studio, which looks out upon a lily pond and the gently sloping acres of woodland. In this setting his subject matter – from screech owls to raccoons, from songbirds to foxes – is a mere arm’s length from his sketchpad. “My home is like the place where I grew up in Italy,” Carmelo says. In the mountain orchards around Francavilla, Sicily, Carmelo first fell in love with his natural surroundings. The temperate climate and rich foliage of his native country made an indelible mark on hims as a boy, who as long as he could remember loved to draw and paint. Carmelo moved to the United States with his family when he was ten, settling in the Maryland suburbs of Washington, D.C., where he found a rich store of natural beauty. “I went through many phases in my experience as an artist, heavily influenced by Salvador Dali and Caravaggio,” Carmelo explains. 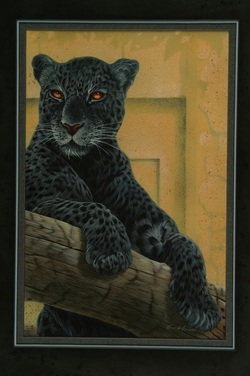 “During college I tried a number of artistic subjects and styles and even specialized in portraits for a while.” It wasn’t until years after studying fine art at American University that he began to paint wildlife art. 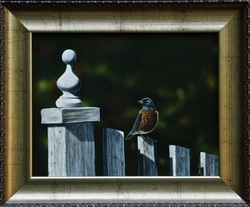 An avid interest in bird watching has fueled Carmelo’s growing interest in wildlife art. Though he sometimes uses photographs to plan a composition, Carmelo isn’t interested in reproducing his subjects with unwavering scientific accuracy. He is intent instead on capturing a mood and creating a feeling about a scene. “Art comes first, the subject matter second,” says Carmelo. “I don’t care if the exact number of feathers on a wing is off by one or two. I’m an artist first, a wildlife artist second. I’m looking for a certain character, an attitude to come through in my work,” he adds. The oils and watercolors Carmelo was producing gradually gave way to a challenging new technique, which he has truly developed from scratch. That’s because he’s created his own style, his own tools and his own special techniques for the uncommon medium of scratchboard. The reverse of a normal black on white drawing, scratchboards are stiff white boards covered with indigo paint. Carmelo imports a high grade board from London to enhance the quality of the white composition on a coating of velvety black. Carmelo first sketches a soft pencil outline on the painted board as a rough guideline. He uses exacto knives to etch hundreds of minute lines to carve complex patterns in the inked surface. Cutting and scraping the ink from the scratchboard results in an almost three-dimensional image adding subtle shading and texture to the composition. One of only a half dozen artists who have mastered color scratchboards, Carmelo loves the total control the medium provides him and its unusual effects. With painstaking attention to detail, Carmelo adds layers of color to the scratchboard, which seem to sparkle in the light like little diamonds or jewels. By trial and error he has developed his own trade secrets for mixing color and types of paint. “There were no instructional courses in this technique,” Carmelo says. Carmelo’s biggest artistic goal is to take scratchboards to the limit. Some think he already has, as he is often considered one of the best in the field, but Carmelo expects more from himself. Carmelo claims he’s not even close to what he hopes to ultimately accomplish, as his work continues to reach new heights in artistic excellence. Carmelo Ciancio’s success story provides something of an inspiration to those of us with grand reveries: Every swan that so dreams, someday spreads its wings. 1991 Governor’s Award for significant contributions to wildlife conservation programs in Maryland and the mid-Atlantic region.